Is there a growing chance that the Shore area will be spared from the bulk of the snow in Tuesday’s nor’easter after all? The latest snowfall predictions from the National Weather Service office in Mount Holly calls for a lessened accumulation in Ocean County – 4-6 inches in Toms River – and just 2-3 inches along the immediate shoreline. 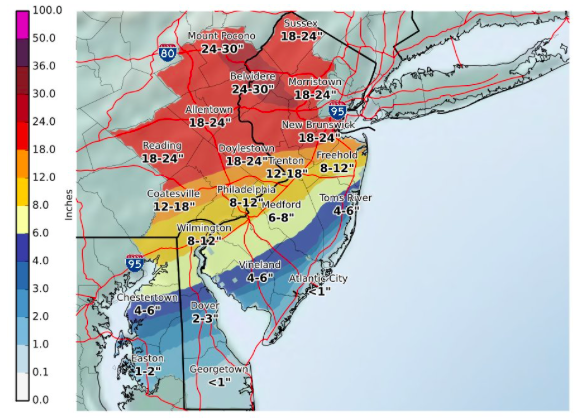 While sections of North Jersey and the interior portion of the state will receive as much as 18-24 inches from the storm, coastal sections are largely being spared, the new graphic, reflecting 8 p.m. Tuesday through 8 p.m. Wednesday, shows. Just south of Toms River, the snow forecast drops even farther, showing Atlantic City receiving less than an inch of snow from the storm. Indeed, most forecast maps show northern Ocean County straddling the line of heavier snow totals to the north and scant accumulation to the south. Skeldon’s own map shows 3-6 inches falling throughout most of the county, with a sliver of the northern portion of the county receiving 6-12 inches. Coastal areas will still receive a punch from the potent storm. Forecasters are calling for wind gusts into the 65 m.p.h. range during the height of the storm, occurring during the daytime hours Tuesday.